The 45-year-old commercial driver, Saturday Akpomose, who was attacked by seven dogs at Ajah area of Lagos State, has received N30,000 and a job offer from the owner of the dogs. However, his family members expressed anger when they heard that Akpomose collected money from the dogs’ owner, who is a soldier. Vanguard learned that the victim, who was admitted at Akodo General Hospital after the attack, was discharged on Friday, May 1, after about eleven days. It was gathered that before the victim was discharged from the hospital, he demanded N5 million compensation from the soldier, but was persuaded and later given N30,000 to take care of himself, while a bag of rice and beverages were also given to his wife. When Vanguard visited Akpomose in his residence, he said the money given to him was not a pay-off, as the man had promised to further take good care of him and his family. He said: “I believe you saw all the injuries on my body. They have not healed completely. I collected the money from him because I am not a troublesome person. I have left everything to God. “When the dogs attacked me, I tried to protect my neck, my private parts and my stomach, because I knew if the dogs touch any part of these places, I am gone. “That was one of the reasons I decided to settle out of court with the owner of the dogs. If I had died my family member would have collected the money and enjoyed it. When Vanguard visited the house where the dogs are domiciled, the Chief Security Officer working in the building, who identified himself simply as Victor, said the matter had been settled out of court. He said: “After we footed his medical bill, he was demanding N5 million from my boss to set up a business and feed his children, claiming that he cannot work now due to the injuries all over his body. ‘’But to our surprise, after the incident, Akpomose’s family members came to our house and started accusing us of using him for ritual. They claimed that after the incident, we slaughtered four cows and rams to appease the gods in the house. “We have told his family members, who are threatening us with law suit, that after settling with the victim, they should go ahead with whatever they want to do because we have done our best. It would be recalled that in the early hours of Tuesday, April 22, seven dogs, allegedly owned by a captain serving in the US marine, were reportedly being taken out of the compound to ease themselves when they attacked Akpomose. It took the intervention of residents and passers-by to rescue him from the dogs. 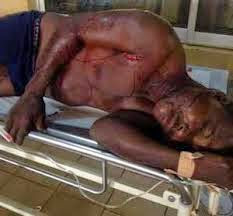 The incident was later reported at Ogombo Police Division, which referred Akpomose to the General Hospital at Akodo, Ibeju Lekki Local Government Area due to the severity of the injuries he sustained.